If downtime in your business equals disaster, Mitsubishi Electric achieves the highest reliability among backup power electronic suppliers. The Energy Star website has reported that Mitsubishi's SUMMIT Series® 750 kVA UPS achieved a 99% efficiency during independent testing, It beat out 117 other double conversion UPS products. The 9900CX Series UPS handles more load while taking up less floor space, and available in three new sizes: 1.4, 1.75, and 2.1 MVA. The 9900CX Series Uninterruptible Power Supply offers Mitsubishi Electric reliability at unprecedented load capabilities and in a fraction of the footprint. It can handle the same load in 65% of the footprint, enabling 35% for revenue generation. Recently certified by Energy Star to demonstrate 99% efficiency, the Summit Series® UPS is rated as the most efficient online uninterruptible power supply. Mitsubishi Electric continues to lead the critical power equipment industry by introducing the first UPS to feature Silicon Carbide (SiC), the technology cited by IEEE as a revolution in power electronics. The SUMMIT Series® ultra high efficiency, small footprint, and lower cooling requirements minimize total cost of ownership without compromising load and power protection. The biggest names in cloud and colo with high loads and the most demanding expectations for uptime have made the Mitsubishi Electric 9900C their UPS of choice. Providing over one megawatt of power in a single UPS, the 9900C is smaller in size and lighter in weight than competing products. Boasting up to 97% efficiency, it is the first true on-line double conversion UPS at this power level to deliver the highest efficiency across all loads. 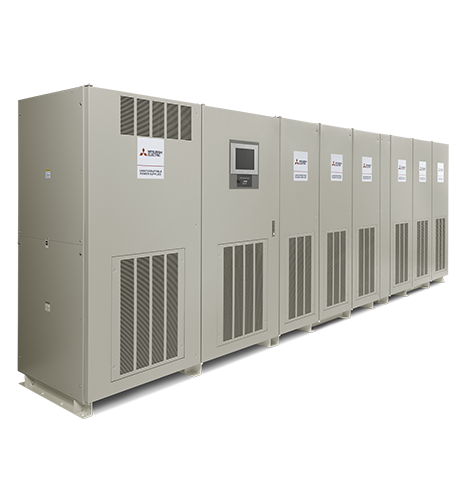 With over 2000 units in North America alone, the Mitsubishi Electric 9900B is the standard for UPS in the 500-750 kVA range. Like all other Mitsubishi Electric three phase uninterruptible power supplies, the 9900B utilizes proprietary Insulated Gate Bipolar Transistor (IGBT) technology and advanced digital control to provide the highest levels of reliability and efficiency in mission critical backup power. With the DiamondPlus® 1100 Series of uninterruptible power supplies, Mitsubishi Electric quality and reliability extends out beyond the facility's utility power room. Perfect for server rooms, network closets, and control rooms, Mitsubishi Electric's DiamondPlus® models provide high performance power protection for lower but still critical loads. Hot swappable power modules provide maximum flexibility for expansion as well as rapid maintenance and repair. With more than 250 certified technicians in the field, Mitsubishi Electric offers around the clock protection, keeping your operations safe against outages, grid decay and other crucial threats to the flow of business. Our services include preventative maintenance checks, priority demand on parts and service, and 24/7 communication with experienced technical support staff. Comprehensive maintenance inspections include UPS diagnostic reports, complete battery testing, and site hazard checks to keep your systems running at maximum efficiency. Other services include factory witness testing and collaborative engineering. With highly skilled technicians, day and night technical support, and premier equipment, Mitsubishi Electric has the resources to keep customers safe from the unexpected. Mitsubishi Electric’s experts in critical power systems and applications support customers and partners from inquiry to implementation. Every Mitsubishi Electric UPS is tested prior to shipment and furnished with the signed test report. Startup and on-site testing of equipment is performed by Mitsubishi Electric factory trained and certified technicians. Mitsubishi Electric has experience and solutions for upgrading and updating existing critical power infrastructure. Operational training is provided to on-site personnel with every startup. Maintaining a healthy battery string is vital to protecting your critical load. Annual maintenance plans keep your system running at optimal performance. 24x7 technical support coverage – including weekends and holidays. Whether it be in support of IT, communications, medical, or manufacturing equipment, Mitsubishi Electric has an Uninterruptible Power Supply for ensuring that continuous clean power is reliably supplied and critical operations achieve the highest level of uptime. As the cost of downtime has skyrocketed for virtually all types of businesses, Mitsubishi Electric achieves the highest reliability among backup power electronic suppliers. In addition to maximizing uptime, Mitsubishi Electric understands the distinct challenges within a variety of market segments and delivers critical power solutions that provide excellent value in the areas of high efficiency, rapid deployment, total cost of ownership, scalability, premier service and support.